Background Short-course oral corticosteroids are routinely used to treat acute asthma and croup. We evaluated their tolerability and palatability in Saudi Arabian (SA) and UK children. Methods Prospective observational/interview study (3 months in each country). Palatability was evaluated using a 5-point facial Hedonicscale and tolerability by direct questioning of patient/parents. Results In SA, of 122 patients (2–10 years) recruited, 52 received prednisolone base tablets, 37 prednisolone sodium phosphate syrup and 33 received dexamethasone elixir. In the UK, of 133 patients (2–16 years), 38 received prednisolone base tablets (mainly crushed and dispersed), 42 prednisolone sodium phosphate soluble tablets and 53 received dexamethasone sodium phosphate oral solution. In both countries, dexamethasone had the highest palatability scores (SA mean: 1.97; UK mean: 3) and prednisolone base tablets had the lowest (SA mean: 1.12; UK mean: 1.39). Palatability scores improved for all formulations of prednisolone with each subsequent daily dose. In SA, prednisolone base tablets were associated with more nausea (24vs7 patients) and vomiting (5vs0 patients) than sodium phosphate syrup (p=0.008 and p=0.073, respectively). In the UK, vomiting occurred more frequently with prednisolone base (8 patients) than sodium phosphate soluble tablets (2 patients) (p=0.041). In both centres, dexamethasone was associated with less side effects. Vomiting (1vs0 patients), nausea (7vs3 patients) and abdominal pain (10vs8 patients) occurred more with dexamethasone sodium phosphate solution than dexamethasone elixir. Conclusions Dexamethasone sodium phosphate solution was the most palatable preparation. Prednisolone base tablets were rated least palatable and were least well tolerated. Palatability scores improved with each dose taken. Oral prednisolone and dexamethasone are widely used in children to treat conditions such as asthma and croup. The taste of prednisolone in particular is an issue which may affect adherence to treatment in children. Dexamethasone was rated as more palatable than prednisolone in two different countries. Prednisolone sodium phosphate seems to cause significantly less nausea and vomiting than prednisolone base and is rated more palatable. Experienced patients gave better taste scores for all formulations compared with naive patients. We describe a prospective observational study in the paediatric wards of Gurayat General Hospital (GGH) in Saudi Arabia (SA) and Derbyshire Children’s Hospital in the UK to evaluate and compare the tolerability and palatability of routinely used preparations of oral prednisolone for patients with asthma and oral dexamethasone for patients with croup. The study was conducted in the children’s emergency department (ED) of the two hospitals. Children suffering from asthma or croup, prescribed oral prednisolone or dexamethasone and able to understand the study’s palatability scale and communicate their response were approached for consent. The drugs and products administered were in accordance with standard practice in each department. Choice of product and routine care of the patients were unaffected by the study. In SA, patients were treated with prednisolone base 5 mg tablets (Gupisone, Julphar, UAE), prednisolone sodium phosphate 15 mg/5 mL syrup (Predo, Jazeera Pharmaceutical Industries, SA) and dexamethasone 0.5 mg/5 mL elixir (Decadron, Algorithm Pharmaceutical Manufacturers, Lebanon). The study was conducted for 3 months between 1 February and 30 April 2015 in GGH. It included only children ≤12 years of age as paediatric admissions in SA are limited to this age. In the UK, children (2–18 years) were treated with prednisolone base 5 mg tablets (prednisolone, Actavis UK, UK), prednisolone sodium phosphate 5 mg soluble tablets (soluble prednisolone, Amdipharm UK, UK) and dexamethasone sodium phosphate 2 mg/5 mL solution (dexamethasone, Focus Pharmaceuticals, UK). The study was conducted in the children’s accident & emergency (A&E) department and hospital wards, for 3 months between 15 September and 21 December 2015. We used a 5-point facial Hedonic Scale to assess palatability in both countries, as used previously in studies comparing the taste of analgesic and corticosteroid preparations in children.6 7 The scale was explained to the patient and parent by the researcher who were then asked to rate the palatability of the medication within 10 min of taking the drug where possible, by pointing to the appropriate face. To evaluate taste in younger patients who were unable to self-report, parents were asked to help in interpreting what their child thought of the taste of the medication. Tolerability (nausea, vomiting and abdominal pain) as reported by the parent/patients in response to direct questions was documented 30–60 min after each drug administration. To evaluate nausea in younger patients unable to self-report this symptom, their parents were asked if they had observed any change in their child’s well-being which suggested them to be experiencing nausea including dizziness, lethargy or being cold and clammy. Palatability and tolerability ratings were obtained from patients after each dose of medication until the course ended. The researcher contacted the parents by telephone if the patient had been discharged, alternatively parents were given the option to complete the data collection form themselves and return it by post using a prepaid envelope. 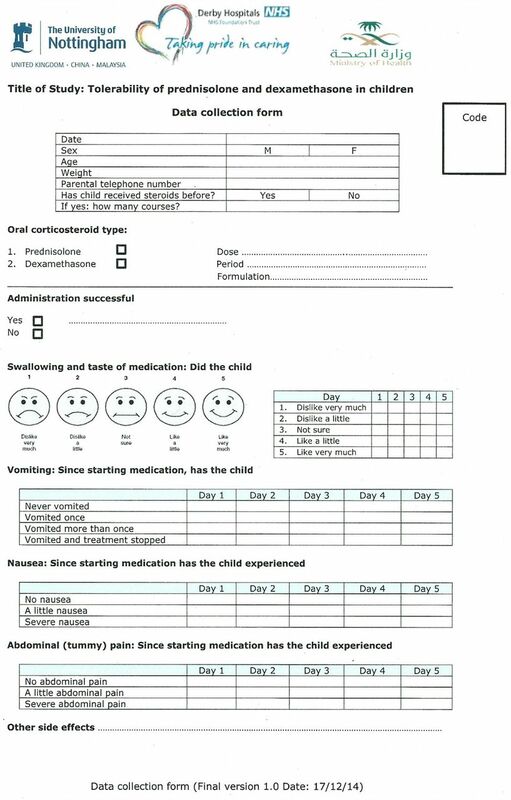 The data collection form (DCF) used for each patient was a modification of questions used in two previous studies of acceptability and/or side effects in children receiving short course prednisolone for the treatment of acute asthma8 9 (figure 1). Percentages and χ2 testing were used for categorical variables to compare between tastes of different dosage forms and the tolerability of each drug. Categorical data were compared using the χ2 or Fisher’s exact test where appropriate. The McNemar-Bowker test was used to compare among the same group of patients how the taste score changed between different days. A significance level of p<0.05 was accepted as significant for all the tests. In SA, ethical approval (Ref: 620/13/54) was obtained from the hospital Quality and Patient Safety Committee (QPSC) on 23 December 2014. In the UK, ethical approval (REC Ref: 15/EM/0057) was obtained from East Midlands—Derby Research Ethics Committee on 19 March 2015. In SA, 141 children were approached for the study. Nineteen children were not recruited: 11 because the parents refused to take part and 8 children were missed for observation (see online supplementary figure 1). One hundred and twenty-two children were enrolled to the study (table 1). Most of them were with asthma (89) aged 2–10 years, and the others had croup (33) aged 2–5.5 years. The patients with asthma received two formulations of prednisolone (52 received prednisolone base soluble tablets and 37 received prednisolone sodium phosphate syrup). The croup patients all received oral dexamethasone elixir. Prednisolone base tablets were crushed and dispersed in water in all cases. Most patients were aged between 2 and 5 years old. The dose between prednisolone groups was almost the same. Around half of the patients in the prednisolone groups had received oral steroids in previous disease episodes, while in the dexamethasone group no patients had oral steroids before. In the UK, a total of 147 children were approached. Fourteen children were not recruited: 6 because the parents refused to take part and 8 children were missed for observation (see online supplementary figure 2). One hundred and thirty-three children were enrolled to the study (table 1). Most of them were with asthma (80) aged 2–16 years and the others had croup (53) aged 2–10 years. The patients with asthma received two formulations of prednisolone (38 received prednisolone base tablets and 42 received prednisolone sodium phosphate soluble tablets), and all patients with croup received oral dexamethasone sodium phosphate solution. Crushed prednisolone base tablets and prednisolone sodium phosphate soluble tablets were dispersed/dissolved in water and a few patients followed administration by a drink of blackcurrant juice if the patient chose to when offered this by a nurse. Only five patients received solid prednisolone base tablets. Most patients were aged between 2 and 5 years old in all corticosteroid groups. The dose between prednisolone groups was almost the same. Most patients in the prednisolone groups had received oral steroids previously, while in the dexamethasone group most patients had not received oral steroids before. In SA, the majority of the children on the first day disliked the taste of the medicines (100% of prednisolone base tablet group, 89% of prednisolone sodium phosphate group and 76% of dexamethasone group) and no patients stated that they liked the taste on any day (table 2). Prednisolone base was disliked the most (89%), and dexamethasone was disliked the least (27%) (p<0.0001). Both prednisolone base tablets and prednisolone sodium phosphate syrup were rated significantly more palatable day by day (see online supplementary table 1). The children who had received oral corticosteroids before (experienced patients) reported different palatability scores compared with the children who received the medicine for the first time (naive patients). These differences in taste scores were statistically significant on the first 3 days (figure 2). Mean taste scores of prednisolone base and prednisolone sodium phosphate according to drug history in SA and in the UK. Pred. Base, prednisolone base; Pred. Na3PO4, prednisolone sodium phosphate; E, experienced patients; N, naive patients; SA, Saudi Arabia. In the UK, the majority of the children on the first day disliked the taste of the medicines (90% of prednisolone base tablet group, 62% of prednisolone sodium phosphate group and 34% of dexamethasone group) (table 3). On day 1, most patients that received prednisolone base (77%) disliked the medication very much as did 36% of the prednisolone sodium phosphate group. Only 6% of patients disliked dexamethasone very much (p<0.0001). Both prednisolone base tablets and prednisolone sodium phosphate soluble tablets were rated significantly more palatable day by day (see online supplementary table 1). The children who had received oral corticosteroids before (experienced patients) reported different palatability scores compared with the children receiving the medicine for the first time (naive patients). These differences in taste scores were statistically significant on day 3 only (figure 2). Most treatment naive croup patients disliked the taste a little (40%) or were neutral (40%), while 33.3% of experienced patients were neutral, 33.3% liked the taste a little and 17% liked the taste very much. The differences were statistically significant (p=0.021). In SA, five patients in the prednisolone base group experienced vomiting, while no patients experienced vomiting in the prednisolone sodium phosphate group (p=0.073). Nausea was reported among almost half of the patients taking the prednisolone base formulation (24 patients). This was significantly more frequent than with the prednisolone sodium phosphate formulation (OR=3.67; 95% CI 1.26 to 11.58, p=0.008). Abdominal pain, however, was reported more frequently in patients taking the prednisolone sodium phosphate formulation (n=13) than in patients taking the prednisolone base formulation (n=8) (OR=2.9; 95% CI 1.1 to 8.1, p=0.031). The patients who received dexamethasone experienced nausea and abdominal pain at rates of 9% and 24%, respectively, of the total 33 patients, but no patients experienced vomiting. Other side effects were also reported. Behavioural change and sleep disturbance were the most common side effects. They occurred much more frequently with prednisolone base tablets than prednisolone sodium phosphate syrup, behavioural change (9 vs 2) and sleep disturbance (9 vs 3). The differences were, however, not significant (p=0.11 and p=0.34, respectively). In the UK, eight patients in the prednisolone base group and two patients in the prednisolone sodium phosphate group experienced vomiting (p=0.041). Nausea was significantly more frequent being reported by almost half the patients taking the prednisolone base formulation (17) compared with a third of patients taking prednisolone sodium phosphate (11) (OR=2.3; 95% CI 0.8 to 6.5, p=0.103). Abdominal pain was reported more frequently in patients taking the prednisolone base formulation (n=10) than with the prednisolone sodium phosphate formulation (n=7) (OR=1.8; 95% CI 0.5 to 6.3, p=0.413). The patients who received dexamethasone experienced vomiting, nausea and abdominal pain at rates of 1.9%, 13.2% and 18.9%, respectively, among the total number of patients (53 patients). Other side effects were also reported. Behavioural change and sleep disturbance were the most common side effects. They occurred more frequently with prednisolone base tablets than prednisolone sodium phosphate soluble tablets, behavioural change (11 vs 9) and sleep disturbance (6 vs 2). The differences were, however, not significant (p=0.45 and p=0.14, respectively). Nausea and vomiting were more frequent with prednisolone base tablets in both countries. Prednisolone sodium phosphate syrup resulted in more abdominal pain in the SA children. Others have demonstrated increased vomiting with prednisolone base tablets.10 This variation of reported side effects shows that the formulation is important. Most children in both countries required the prednisolone base tablets to be dispersed in water prior to administration as they could not swallow whole tablets. This may have reduced the tolerability. If improved taste and less side effects were the only deciding factors, prednisolone sodium phosphate would appear to be the best choice for asthmatic children of the commonly used medications, but other factors also need to be considered. Oral dexamethasone has been shown to be an effective alternative to oral prednisolone in the treatment of acute asthma in children.12 Keeney et al suggested that 2 days of oral dexamethasone is similarly effective to 5 days of oral prednisolone with evidence that dexamethasone might be better tolerated and require shorter duration of therapy.13 Since dexamethasone was the overall most palatable and best-tolerated preparation when given as a single dose for croup, this may suggest that it would be a useful alternative in the treatment of children with acute asthma episodes. Taste ratings improved throughout the duration of the treatment. In addition, children who had received oral corticosteroids before (experienced patients) reported significantly higher (more favourable) palatability scores than children who received the medicine for the first time (naive patients) in both countries studied. Research suggests that the physiology and neurobiological mechanisms underlying the taste function mean that the impression of taste changes with time and experience and leads to adaptation of taste perception.16 The experienced patient who is familiar with the medication taste may therefore have adapted and started to accept it. This may also explain our findings that the taste ratings of all medications improved in both countries day by day. It is also possible that as treatment becomes effective and children start to feel better, they become more cooperative and tolerant. No other studies identified, however, have made this observation of increased tolerability with time or with experience for these drugs. In conclusion, dexamethasone was rated more palatable than prednisolone. For patients with asthma, prednisolone base tablets were rated the least palatable preparation and were also the least well tolerated. Prednisolone sodium phosphate was associated with a significantly lower incidence of nausea and vomiting and better taste score, compared with prednisolone base. Best practice suggests that prednisolone sodium phosphate or dexamethasone should be used. Paediatric Medicines Research Group, Division of Medical Sciences & Graduate EntryMedicine, School of Medicine, Faculty of Medicine & Health Sciences, University ofNottingham, Royal Derby Hospital Centre (RDH). We thank all the paediatric nurses, parents and children in each centre who allowed us to observe them during the study. Also, we would like to extend our greatest appreciation to all ward staff for their kind assistance and cooperation throughout the observation period in each centre. In addition, we also thank Janine Abramson and Coral Smith for assisting during the study period and recruitment. Eur Med Agency. Guideline on pharmaceutical development of medicines for paediatric use. 2013 http://www.ema.europa.eu/docs/en_GB/document_library/Scientific_guideline/2013/07/WC500147002.pdf (accessed 1 Aug 2015). EMEA. Reflection paper: formulations of choice for the paediatric population EMEA/CHMP/PEG/194810/2005. London, 2006. http://www.ema.europa.eu/docs/en_GB/document_library/Scientific_guideline/2009/09/WC500003782.pdf (accessed 27 Aug 2016).
. Comparison of paediatric steroid mixtures. Aust J Hosp Pharm 1998;28:246–9.
. A palatability study of a flavored dexamethasone preparation versus prednisolone liquid in children. Can J Clin Pharmacol 2008;15:e95–8.
. Tolerance and compliance of oral prednisolone therapy during acute childhood asthma. Aust J Hosp Pharm 1992;22:278–82.
. A comparison of the acceptability of prednisolone tablets and prednisolone sodium phosphate solution in childhood acute asthma. Aust J Hosp Pharm 1993;23:320–3. Medicines Complete. BNF for children. https://www.medicinescomplete.com/mc/bnfc/current/index.htm (accessed 20 Sep 2016). Contributors FA, IC and SC conceived the idea and designed the study as part of FA’s PhD. FA did the data collection and analysed the data and wrote the first draft. MA, IC and SC reviewed and validated the data and revised the paper. Competing interests No direct funding; however, the author FA is a postgraduate student and would like to acknowledge his sponsor the Saudi Arabian government (Prince Mohammed Medical City). Ethics approval East Midlands-Derby Research Ethics Committee.